Submitted by Edward Revy on February 28, 2007 - 14:34. 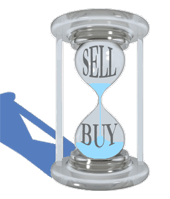 Exit rules: Sell when the opposite situation (next crossover) occurs and right after that open an opposite position. It is again recommended, once the first touch of Stochastic lines (possible future crossover) has been spotted, to wait until the following price bar on the chart has closed and only then take actions. Advantages: can give entry and exit rules, easy to use. Disadvantages: Stochastic is a lagging indicator – with this lines crossover system it can create a lot of false signals. Traders may want to change Stochastic regular settings for each particular currency pair to eliminate as many false signals as possible. 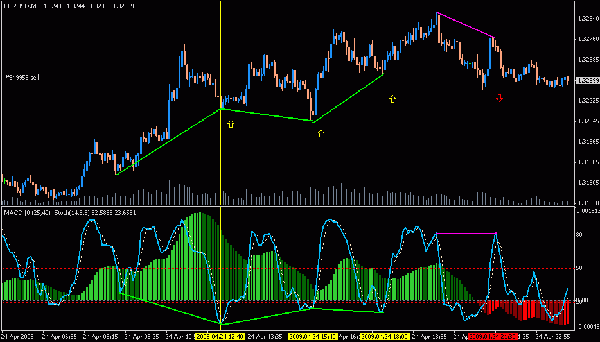 Stochastic crossover system is good when used in combination with other indicators. Submitted by User on March 24, 2012 - 22:15. Submitted by Paul on May 21, 2009 - 21:55. I am using Metatrader 4 for indicators, vertical lines and arrows. I draw the green and pink lines with Irfanview from a printscreen. Submitted by User on May 21, 2009 - 14:10. The one few comments above is MetaTrader 4.
the one shown on the first page in the strategy rules is FX Trade from Oanda. 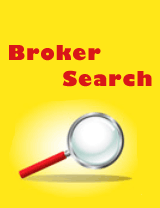 All trading packages are free with any forex broker. Submitted by Barry on May 12, 2009 - 13:52. 1) What Charting package is this, that you're showing in your screenshot? 3) Could you provide the Website info? I'm looking for a good, clean, simple charting package just like this, to use---any suggestions? Submitted by Edward on May 2, 2009 - 08:47. "Stochastic" and "Stochastic oscillator" are synonyms: simply the Stochastic indicator belongs to the group of oscillator indicators. Try settings: 14, 3, 3 and 5, 3, 3. 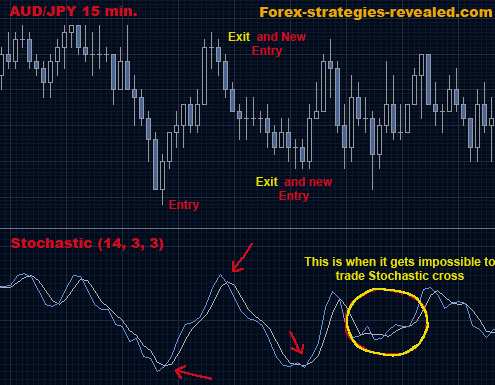 Please read further about Stochastic indicator here. Submitted by User on April 29, 2009 - 21:38. Edward, First of all thank you for this wonderful strategies. How do I know whic line is Fast Stochastics or Slow Stochastics. Submitted by Suri on April 27, 2009 - 09:44. * is second one name Full Stochastic? * I Usually trade in time frame M1 OR M5 which setting is suitable (14,3,3) ? Submitted by Paul on April 24, 2009 - 17:29. The reason I use MACD(25,40,1) is to simulate the trend in a higher timeframe. Other indicators can be used for that. It could be compared to a cross of SMA(5)X SMA(8) in a timeframe 5 times higher than the current. You could use a cross SMA(25) X SMA(40), but MACD is visually interesting and it gives information on a possible exhaution of the trend (dark green and red on picture) if you have a color MACD histogram. Also, stochastic solely can be used to identify divergences (lime green lines bullish and pink lines bearish) wich increases the probability of the trade. So if stochastic is crossing from overbought/oversold area in direction of the trend on MACD and showing at the same time a desired divergence, you should have a good trade. Don't forget your stop loss. Submitted by Danny on April 17, 2009 - 13:25. Paul with the MACD set @ 25.40.1 would it not be better to use a CCI or some other one line Indicator.. Submitted by Paul on January 21, 2009 - 10:36. I would recommend using signals in overbought(>80)/oversold(<20) zones only. Also, filtering out taking only trades going in the MACD (25,40,1) direction (above or under 0) will eliminate quite a few trades, but the valid signals will show a higher probability of success. Submitted by Edward Revy on January 15, 2009 - 11:53. Yes, it can be used to trade on 5 min charts. Same Stochastic settings are needed for EURUSD. Also, you can experiment with faster Stochastic (5, 3, 3) and a slower, but smoother one (20, 3, 3). Submitted by Andrew on January 15, 2009 - 11:26.
and you used Stochastic (14, 3, 3) for AUD/JPY. Wich do you think it is better to EUR/USD? Submitted by Andrew on January 15, 2009 - 11:23. I would like to know if this can be used in a 5min chart. Submitted by User on October 9, 2008 - 18:02. Submitted by User on March 7, 2008 - 11:57.